Older people in the UK are often living in isolation, a charity has warned - putting them at risk of depression and ill-health caused by loneliness. 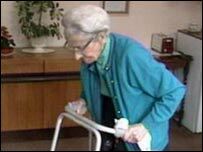 Age Concern said over 3.5m older people lived alone, many without regular visitors or opportunities to get about. A survey of 1,000 adults for the charity found that one in five people aged over 65 spent more than 12 hours of every day alone. The same age group was more likely than any other to be alone 21 hours a day. The study also found that a quarter of people over 65 do not have a best friend. "Over 3.5m older people live alone and many do not have regular visitors or any opportunity to get out of the house," said Gordon Lishman, director general of Age Concern England. "It costs £15,000 to set up and run a local befriending scheme to benefit 50 isolated older people over a year," he added. Tesco has adopted Age Concern to be its "charity of the year" for 2005, and hopes their partnership will raise over £2m to fight poverty and isolation among the elderly. The initiative will be launched at Tesco stores at 1100 on 17 January.